Here are ten facts about spinosaurus. Spinosaurus lived in parts of what is now northern Africa, between 112 and 97 million years ago. It may well have been the largest of the carnivorous dinosaurs. The first spinosaurus fossil was found in Egypt shortly before World War 1 and kept in a German museum. However, the remains were destroyed during a bombing raid during World War 2. One of its most distinctive features of spinosaurus was the fin, or sail on its back. This may have been used to catch the sun’s rays and warm the creature’s blood. The sail was supported by neural spines, which were often almost 6 feet long. These were thin bony rods which projected from the individual vertebrae. The spinosaurus had an unusually long and narrow skull, adding to its distinctive appearance. It had short, but very sharp teeth. Some scientists think the species may have walked on all fours at one time. The spinosaurus was up to 60 feet long and could weigh up to 23 tonnes. It was probably capable of running at 15 mph, which was very fast for its size. 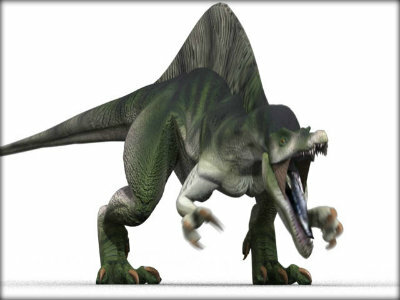 The spinosaurus featured prominently in the movie Jurassic Park 3. The species has also appeared on the stamps of several African countries, including the Gambia and Tanzania. Some scientists believe that spinosaurus may have been a scavenger, using its alligator like mouth to feed on rotting flesh, where as others think it would have been a formidable predator. Its long snout may have been used to catch fish.